W9DXX, Alice Bourke, Chicago, IL ca.1935 - from Frank C. Jones "Radio Handbook" 1936. This interesting photo shows a very early HRO receiver with a PEAK Pre-selector to the left and a 1934 AGS-X receiver to the right. 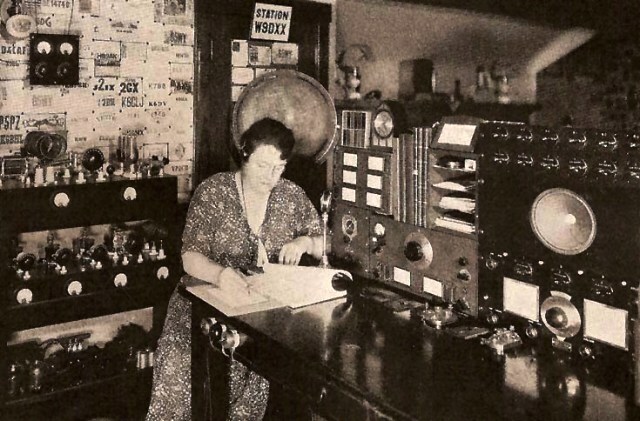 Alice Bourke was a reporter for the Chicago Tribune along with being very active in ham radio. >>> Herbert Hoover Jr. was selected by the Bureau of Aeronautical Commerce to coordinate the job of designing a replacement for the AGS receiver. He was living in Pasadena, California and teaching part-time at Cal Tech. Hoover, of course, contacted James Millen at National Co., since the creation of a "sophisticated" design was going to require the expertise that National had gained building the AGS receivers. 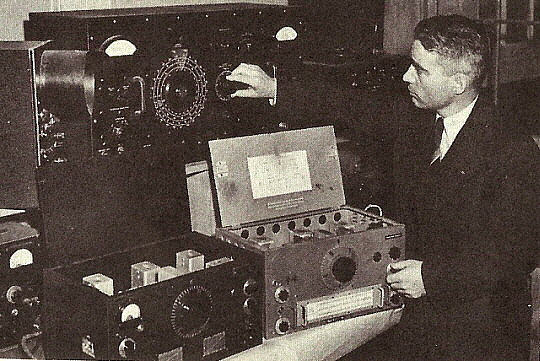 Hoover setup a lab in his garage, employing Howard Morgan from Western Electric Co. and a few of his technicians to develop the new receiver circuitry. The new receiver would be a team effort with engineers working on the project on both coasts. In order for the "new" AGS replacement to meet the requirements of commercial users, Millen and Hoover thoroughly examined the shortcomings of the AGS/AGU receivers and additionally, examined all of the necessary requirements for an ultimate communications receiver. The two design teams - James Millen, National's Chief Engineer and General Manager, headed the mechanical design team which was located on the East Coast in Malden, Mass. While on the West Coast, Herbert Hoover Jr. headed the electrical design team. Both men agreed that the greatest sensitivity and a low noise floor came from using plug-in coils, eliminating the many types of signal loss found in most bandswitching circuits at that time. Also, to keep other problems (like hum and heat) out of the receiver an external power supply would be used. Maximum efficient operation of each tube stage would keep the number of tubes to a minimum and resulted in a good signal to noise ratio and low drift due to reduced thermal problems. Towards the end of development, Millen personally delivered a prototype HRO to Hoover's lab in Pasadena for final revisions and final testing. At this time, a drift problem turned up when the HRO was used in the bandspread mode. The corrections utilized combinations of brass, steel and aluminum mounts for the trimmers in the coil assemblies to reduce the problem. However, with the resolution the micrometer dial had in bandspread a minor drift of a couple of kilocycles meant that drift showed up as maybe five or six divisions on the micrometer dial. The drift problem was reduced to an acceptable level but it could not be eliminated due to the extreme resolution the HRO had in bandspread. The HRO was designed to use mostly parts that National made. Very few purchased parts were utilized for the HRO. As National stated, "The National HRO receivers are not an assembly of broadcast receiver parts, they are completely designed from antenna to output." In all, the HRO design leapt ahead of any other receiver being built in 1934.
photo above: This 1935 ad is from Leeds, a New York radio dealer, showing the high regard that was accorded the new National HRO. 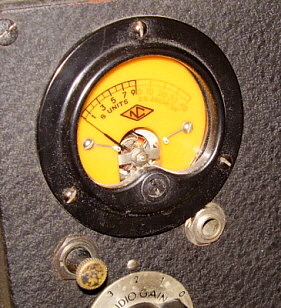 This artwork shows the production receiver with the exception of the knob on the BFO can and the S-meter scale. >>> Production HRO receivers were being built as early as January 1935 but these units weren't shipped out until all of the "bugs" had been worked out. HROs finally began shipping to awaiting customer orders around March 1935. The first HRO receivers were eagerly purchased by National fans because they knew the receiver was going to be the best available since James Millen had been keeping all of the hams informed of the HRO's progress with of his monthly open letter to hams that was published in QST. Prototype HRO Receivers - When National published their bulletin No.240 (a catalog that was inserted in the October 1934 issue of QST) it contained details on the HRO and revealed artwork of a "prototype" HRO (which is shown in a photo above.) The "HRO Prototype" receiver did have a micrometer dial but note that the knob is the type used on National's Type N dial (used on the AGS.) The receiver had AGS style knobs installed. Also note the prototype had a "Volume" control and a BFO switch on the front panel but no front panel BFO adjustment. Also, the coil sets only have one graph which implies that they don't have the band spread function. Absent also is an S-meter switch. Though the artwork of the interior shown in Bulletin No.240 doesn't show the internal BFO knob on the BFO coil can, it was shown in subsequent artwork and photos of other prototypes. These prototypes were never production receivers and were built for testing and development purposes, for artwork or for subsequent photographs. The original development paperwork was usually marked "H.O.R." - for "Hell Of a Rush" but during the finalization phase, someone at National decided they didn't want their new receivers to be referred to as "HORs" so the letters were rearranged and became HRO - then the "Hellva Rush Order" story created to explain the HRO designation. When first introduced, the receiver was the "HRO." No other designation was necessary since it was the only version available. The receiver used nine, 2.5vac heater tubes providing two RF amplifiers, two IF amplifiers, separate Mixer and Local Oscillator functions, a Duplex Diode-Pentode for AVC, Detector and First Audio Amplifier functions, a Beat Frequency Oscillator and a pentode Audio Output Amplifier. The separate power supply utilized a type 80 tube rectifier that actually brought the tube total to ten. 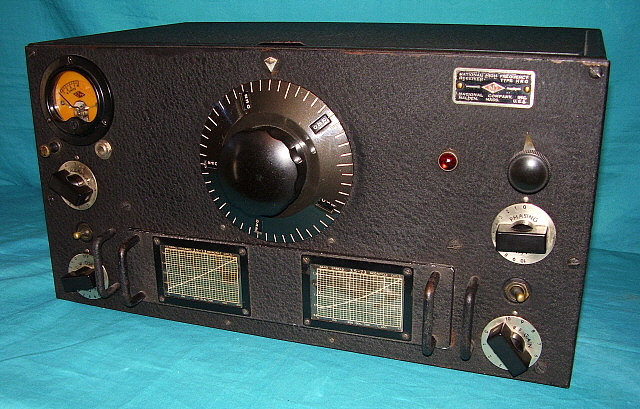 A specific power supply wasn't available for the early HRO receivers, so many receivers were sold with the FB-7 power supply, type 5897AB with the data plate emblazoned "Designed Especially for the FB-7." Many rack mounted power supplies were also produced for the commercial users. Speakers were not specifically available in a table cabinet but National advertising stated that a "loud speaker could be provided, if desired." 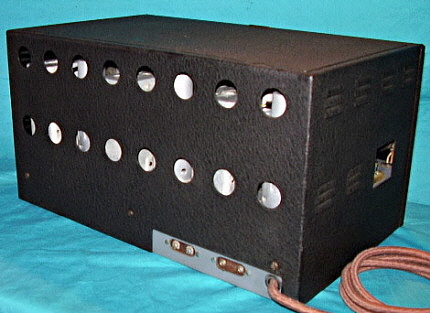 The first advertised speaker shown was a rack mount version. 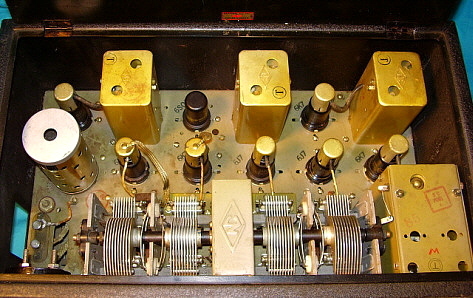 Shown in the photo to the right is a rack mount HRO from the first production run with the serial number of D-65 with its matching serial number coil set. Note that this receiver has all of the features that are found on the earliest production. D-65 has the pearl-button push switch for the S-meter and the small red "NC" dial pointer mounting screw. Also obvious are the white background frequency charts on the coil sets. The S-meter has the first type scale used with the pink colored NC diamond with white letters. The S-meter scale is 0-5 with "PLUS" indicated in the range over 5. This S-meter scale was only used on the first two production runs. The German Silver plated micrometer dial was used on the first five production runs. Notable is the leatherette finish on the panel and on the coil set panels (this finish was used on the rack mount receivers up until around 1940.) The four coil sets are matching serial number originals. Also, note the lack of a finger lift projection on the lid of the dust cover which was standard for rack mount receivers. This receiver was probably built around January of 1935. Close examination of the HRO D-65 revealed that it must have been sent back to National for upgrading, probably around late-1936 or early-1937. The upgrades included a pilot lamp installation, BSW terminal strip for remote standby (included lengthening of the chassis opening and dust cover cut-out as part of the installation,) a set of new knobs for RF Gain, AF Gain, Phasing and C.W. Osc (knobs have the tall boss) and circuit upgrade to the 2B7 Detector, AVC and 1st AF amplifier to conform to the later model HRO. Since the S-meter and pearl button switch weren't changed, the receiver wasn't sent back to National so late as to have these problem-prone parts replaced. All of the rework is factory quality which suggests that D-65 was returned to National for the upgrades. 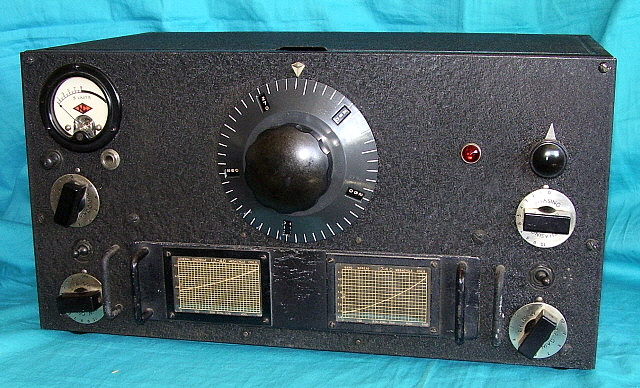 Note that the pilot lamp has been removed and the hole filled to make this first production run receiver appear more like an original example. The top of the chassis is still very original and the underside of the chassis has some replacement components that suggest normal repairs and not any type of rebuilding effort. Fifteen of the paper wax capacitors are still original Micamold brand. HRO sn: E-50 (table model,) second production run built in February 1935 The first HRO production run built a little less than 100 receivers. The second production run, run-E, was going to build substantially more receivers. The total number of E-run HRO receivers is a little less than 200 receivers with the highest reported serial number from run-E being E 178. Very few changes were incorporated into this second run of receivers. The location of the S-meter zero adjustment pot was changed from the front left top of the chassis to near the audio output tube shield and the antenna-ground terminal insulator. The S-meter itself sometimes has minor differences in the housing style used during run-E. The Audio Gain control and 2B7 grid bias circuit changes may have been installed in the later part of run-E. 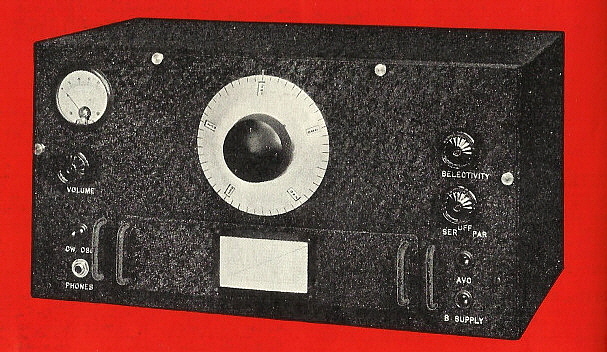 The plated PW-D, the S-meter scale, the pearl push-button S-meter switch, the small red <NC> diamond dial pointer, the white charts, the lack of remote standby and lack of a pilot lamp all remained the same as run-D receivers. Shown in the photo to the left is the second production run HRO E-50. This receiver is a table model version so the front panel is made of sheet steel and is the same width as the cabinet. Table model cabinets and front panels were painted black wrinkle finish. Coil set panels were normally painted to match the receiver panel they were to go with. HRO E-50 spent most of its existence in Alaska where for a time it was used by the CAA whose technicians extensively modified and repaired the receiver. Today, E-50 is a complete and authentically restored example of the second production run of HRO receivers. HRO E-50 is profiled in more detail in the Restoration section further down this web-article. 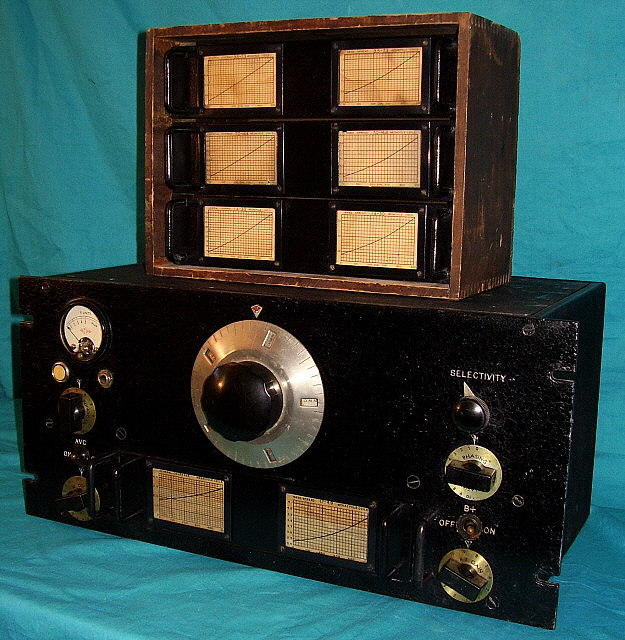 Shown in the photo to the right is an early third production run receiver, serial number F-16, another rack mount version probably built in April 1935. With the third run, a red jewel pilot lamp was now mounted to the right side of the panel between the Selectivity control and the PW-D giving users a visual indication that the receiver was turned on. Note that the S-meter scale was changed with the new scale having the NC diamond in orange with the "NC" in black letters. Also, the "PLUS" that was under the arc above 5 was eliminated. 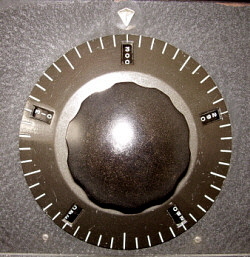 This scale was used from run F to run H. Another S-meter change was the elimination of the pearl push-button switch which was now replaced with a black metal push-pull operated switch. This allowed users to have the S-meter operational without having to hold a button in while tuning an AM signal. During CW reception the S-meter could be turned off. Also, with receivers that were built during the early part of the third run, there still was no remote standby capabilities. Remote standby was added later during run-F. Additionally, the small red <NC> emblem for the dial pointer is still being used with this particular receiver but its use was becoming sporadic beginning in the latest part of run-E. Many F-run receivers will have the newer style dial pointer that was a much stronger part. 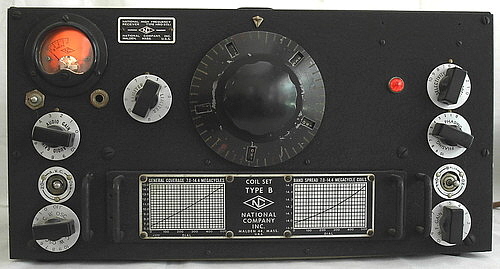 Still in use with early third run receivers were the white background calibration charts on the coil sets although the black charts replace the white charts during run-F. With run-F, the coil set contact buttons were enlarged and raised for better engagement with the finger contacts within the coil bay. F-16 has not been restored,...it was "detailed." The process is covered in the Restoration section of this web-article. photo above: HRO sn: H-103 (table cabinet) was built in September 1935 (5th production run.) By this time, the receivers had remote standby and black background coil charts. 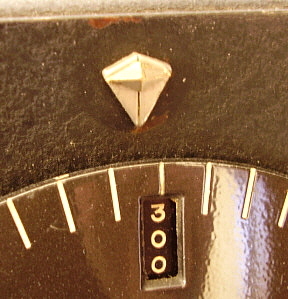 The small, red <NC> dial pointer had been replaced with a small diamond head screw. 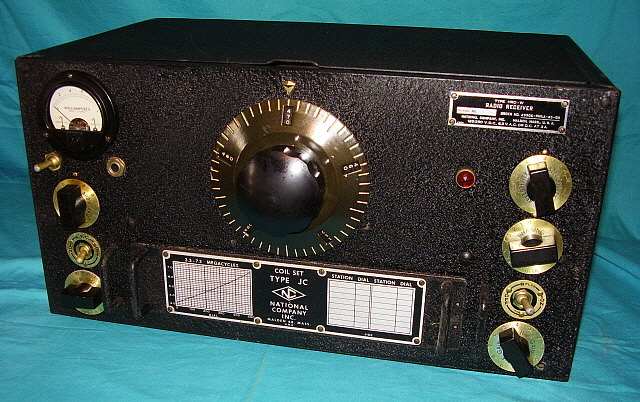 The "H" production run was the last run of receivers to use the plated PW-D, the 0-5 scale S-meter (the later style 0-5 scale is on this receiver) and the early-style cabinet. This photo shows the typical texture of the original, two-part wrinkle finish. Shown to the left is fifth production run HRO, H-103, which is another table model so it has the standard sheet metal cabinet and front panel that is entirely painted black wrinkle finish. 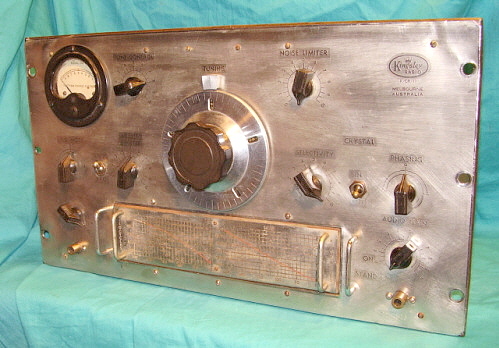 Several changes are apparent when looking at this HRO receiver built in September 1935. The black background frequency charts on the coil set panel were introduced during the third production run (run-F.) Moisture may have caused staining on the white charts that prompted the change to black charts. Gone is the small red <NC> emblem as part of the dial pointer. The replacement is a much stronger, "one-piece" screw that has a diamond shaped head. The small red <NC> emblem was fragile since the small diamond head was machined so thin that it easily broke if over-tightened. H-103 still has the early-style short boss bar knobs and the R-5 S-meter that was introduced in run-F. The other changes aren't so visible. Remote standby was introduced during run-F. A two terminal strip was added to the rear chassis to allow remote switching of the B+. The remote switching initially paralleled the front panel B+ switch but this didn't allow using the front panel B+ for coil changing operations depending on the remote relay. Within a few production runs, the remote standby was rewiring to be a series switch that allowed use of the panel B+ switch regardless of the remote relay set-up. H-103 is profiled in detail in the restoration section further down this web-article. By the end of the first five production runs (D, E, F, G & H,) the HRO had several "tweaks" made to its design. These changes were for the most part subtle with values of a few resistors changed slightly, the wiring of the Detector-1st Audio biasing and AF Gain control revised, some changes to the material that was used a insulation mounts between each section of the tuning condenser, addition of a remote standby circuit, replacement of the pearl push button S-meter switch and the addition of a visual power on indicator. The sixth production run, run-J, would bring several visually obvious changes to the HRO. Gone would be the plated PW-D dial in favor of a painted lacquer version. The cabinet would also now feature improved ventilation with louvers on the side and enlarged holes on the rear. The S-meter scale was changed from the old QSA 0-5 scaling to the RST scaling of 0-9. 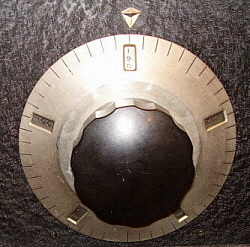 The S-meter housing was changed from metal to bakelite. 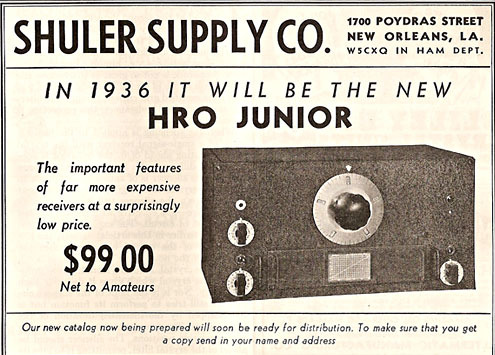 These "J-run" receivers were advertised as the "1936" HRO and by February 1936, the "HRO" became the "HRO Senior." 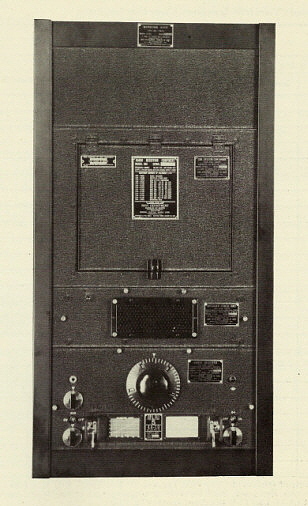 The HRO's design was much more advanced than any other communications receiver available in early 1935. 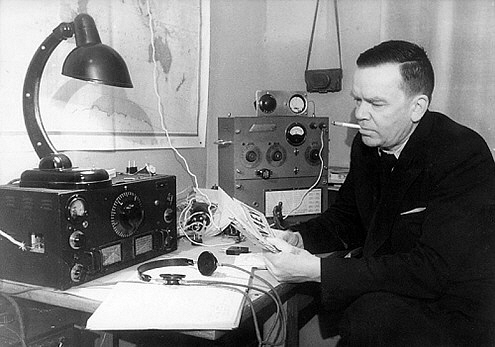 James Millen, using his monthly QST letter to hams, had the ham interest piqued and both commercial users and hams rushed to buy the first HRO production available. Of course, the HRO performance became legend quickly and, if the receiver was affordable to a depression-era enthusiast, it was purchased. The production runs were very small and by the introduction of the HRO Senior in 1936, about 1100 HROs had been produced within the initial five production runs. photo right: HRO Junior sn P-116 from August 1936 with its original P-116 JD coil set installed. Note that this receiver has a gun-metal gray lacquer on the PW-D micrometer dial. Some PW-D dials will have a dark bronze color lacquer paint. Note that the pilot lamp location is different than the HRO Senior. Also, the location of the phone jack is moved since there is no S-meter switch (or S-meter.) Also obvious is the centrally located frequency graph on the coil set. Since the Junior coils didn't bandspread only one graph was necessary. >>> The HRO Junior didn't have a crystal filter. This modification required that the Crystal Filter assembly be replaced with a standard IF transformer. Elimination of the S-meter also eliminated the meter push-pull switch and meter adjustment pot circuitry. Naturally, a different front panel was going to be required since the meter wasn't used. National also moved the location of the pilot lamp slightly to the right and moved the phone jack slightly to the left. The Junior used the same chassis as the regular HRO, obvious because the S-meter pot mounting hole is present as are the mounting holes for the Crystal Filter assembly. photo left: The chassis of HRO Junior P-116 showing the absence of the Crystal Filter and S-meter. Note that the chassis is punched for the S-meter adjustment pot which was located next to the Antenna-Ground terminal insulator. This Junior has the gray chassis paint which started to be used in early 1936. The IF cans had just changed to the square type with the "P" production run. >>> The HRO Junior wasn't very popular and today it is quite a rare set in its original configuration. Most thirties-era hams probably realized that purchasing the Junior wasn't that "good of a deal." The HRO Senior was around $170 with four bandspreading coil sets included. Most dealers would sell the HRO Senior with some money down and monthly payments to follow. The Junior was $99 with one general coverage coil set. Just adding the three coil sets to provide full frequency coverage would run the price up to about $150 and then these coils wouldn't bandspread. The price would be even more if bandspreading coils were desired. For only a few dollars more, the HRO Senior provided many more features. Power supplies and speakers were considered extra accessories for both types of receivers. Most "Juniors" encountered today are really RAS or RBJ Navy receivers - rack mounted HRO Juniors with some modifications for military use. Like Millen had observed with the hams, the Navy found their radio operators had little use for an S-meter, Crystal Filter or Bandspread coil sets. Apparently, American Airlines also felt the Junior was more of what they wanted and some rack mount HRO Juniors were supplied to them. These HRO Juniors are identified with double "AA" preceding the HRO, i.e., AA-HRO. photo left: "In 1936,..." an early advertisement for the Junior's introduction. The artwork example (prototype?) shows the plated PW-D that was probably never used in production. Other changes were to the chassis color, probably to conform with the gray paint that was being used used on the new 1936 NC-100 receivers. This cost savings was realized in that only the small quantity SW-3 receivers continued to have the black chassis paint. Starting in January 1936, most of production now used gray paint for all chassis. photo above: HRO Senior sn: N-130 was built in July 1936 (10th production run) and has the features found in the early HRO Seniors. Most noticeable is the bakelite housing, white face S-meter (that is non-illuminated on early versions) and the painted PW-D. Note that the paint on this PW-D is the dark gunmetal gray lacquer. The cabinet (from run-J on) has side louvers and large vent holes in the rear panel. >>> In the December 1936 issue of QST, National ran an ad on the back-inside cover showing a rack mount HRO finished in gray "leatherette" finish. The photo below shows a table rack designated MRR and a combination speaker and coil storage box designated SPC. The ad states that the rack mount HRO is available, "Your choice of finish, either rich grey or black leatherette." (note the British spelling of gray.) A close-up of the receiver shown in the ad below. This ad ran several times in QST from 1936 up to around 1938. Note the bound QST magazines on the book shelf. The gray wrinkle finish was also an option on the table model HRO (serial number V-27 is original gray wrinkle finish panel and cabinet from 1937.) Besides this advertised color option, HRO receivers have been found with original paint in blue (special orders to RCAF Canada) and smooth machine grayish-blue (possibly other Canadian users.) Other colors probably exist since National would do special orders and had the in-factory paint facilities. Another minor change at the time was to the remote standby terminals which now placed the "BSW" terminals in series with the panel B+ switch requiring a jumper be installed across the terminals if the receiver was used without a remote T-R switch. This seemingly minor change actually now provided the operator of a transmit-receive station the ability to remove the B+ independent of the T-R switch - a function required for safe coil set removal and installation. 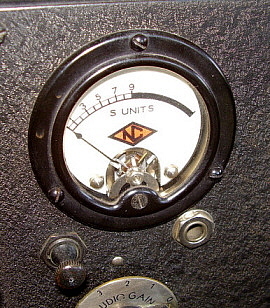 The S-meter had been a Marion Electric Instrument Company bakelite housing meter with a non-illuminated white scale with 0-9 S-units in black and the NC diamond in red. By 1937, this S-meter became an illuminated meter. The next change (early 1938 - possibly by run-W) was to an illuminated light-yellow scaled meter. The S-meter also added "db above S-9" to the scale in red printing. >>> The story goes that National kept up the 2.5vac tube performance "myth" active until they depleted their over-stocked transformers. Many HRO owners did re-tube their older 2.5vac HRO receivers with 6.3vac tubes. More than likely this was due to tube availability rather than performance improvement. About this time, May 1939, James Millen resigned from National. The reason sited at the time was so Millen could form "James Millen Manufacturing Company" but other factors may have been involved. See "HRO Production & Engineering Changes" section (1939) below for several various reasons sited for Millen's departure from National. photo above: HRO Senior sn: 463-K was built in 1940 and has most of the "late pre-war" HRO Senior characteristics. Most noticeable is the illuminated S-meter with amber scale (these scales were originally a light yellow color but darken due to exposure to UV or bright light.) Also note the name plate in the upper right of the panel and the PW-D that has the dark bronze paint. Since the initial design of the HRO was to replace the AGS-based receivers used by some Airways companies, it's not surprising that the HRO found its way into companies like Braniff, Eastern Airlines and American Airlines. From 1935 up to 1937, National provided Airways companies with HRO receivers for use at airports and for airway navigation uses. In 1937, National introduced the RCD, a receiver based on the new NC-100 moving coil receiver that National had introduced in 1936. The RCD provided specific airways features like squelch, relay controlled speaker selection and audio bandpass filters and single audio amplifier output sections designed for either 600 Z ohm lines or 20000 Z ohm speakers that had internal output transformers. No S-meters, no crystal filters and most importantly, no external power supply. Undoubtedly, the Airways companies found the HRO, with its numerous idle coils and separate power supply, somewhat difficult to install and maintain. The RCD and its successors were self-contained receivers only requiring a loud speaker or telephones. After WWII, National upgraded many earlier versions of their airway receivers. 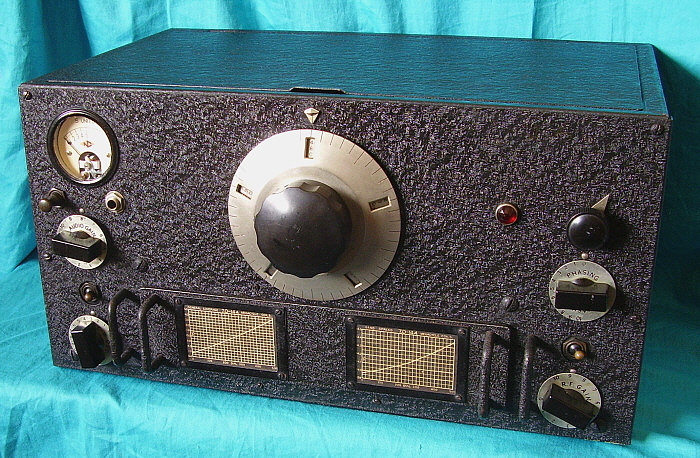 In 1947, the last moving coil airways receiver based on the NC-240CS (the RCR) was released. Shown in the photo to the right are the HRO receivers that were used at Eastern Airlines' Miami Radio Station. This station was basically the aeronautical communications to various airplanes providing weather, flight information and other necessary communications to "in flight" aircraft. Note that there are "banks" of HRO receivers but notice the three receivers near the rear-most operator. The top receiver is the HRO Junior. Note that while the HRO Seniors all have nickel PW-D dials, the Junior has a dark painted dial. Date is probably 1936. Photo is from George Sterling's "The Radio Manual - Third Edition" dating from the late-thirties. Prior to WWII, the Navy was buying some HRO receivers for various uses. These receivers generally will have a National Audio Output transformer installed in the chassis area behind the S-meter and adjacent to the antenna terminals. This area of the standard chassis already had mounting holes and lead thru holes for an audio transformer, implying that National anticipated some customers requiring this option. This would especially be true for many commercial users as well as the military. In fact, some National catalogs do mention that any audio output configuration could be provided. The Navy wanted 500 ohm Z outputs for their requirements and the National transformer usually installed is a National Type S500. Also, these pre-WWII Navy HROs will usually have an "anchor" ink stamped somewhere around the chassis or chassis mounted parts. Other than the audio configuration changes, the pre-WWII Navy HROs are standard production types and even have the standard serial number placement and format which implies that the Navy purchased them "as needed" rather than by a large quantity contract. Perhaps the HRO's most famous use during WWII was in England where banks of HROs were set-up as intercept receivers at various sites. Generally, most reception stations were separated from the transmitting sites and the decoding sites were separate from either the reception or transmitting sites. At first, Britain couldn't buy the HRO receivers directly, so various methods were used to purchase the receivers. Usually, British officials in the US on business would purchase an HRO receiver from a dealer and hand carry it back to England. This rather tedious method lasted until Lend-Lease was passed at which time then the British were able to have a steady supply of HROs direct from National. Many of the HROs sent via Lend-Lease were identified with a double letter prefix to the serial number, e.g., PP or AJ, etc. It also appears that single "P" prefixes with numbers above 150 seemed to indicate HROs destined for duty overseas. The HRO-M & HRO-MX - The HRO Senior was given a few engineering upgrades at the end of 1941 or early in 1942. The most obvious was the modification of the crystal filter to use an internally mounted crystal, thus eliminating the "easy to remove" crystal that plugged into the top of the filter assembly. There was always questions that arouse regarding the plug-in crystal in that the "air gap" required for the crystal seemed to be interpreted as something "loose" and "rattling around" in the crystal. The new design crystal eliminated that unwarranted concern and didn't change how the Crystal Filter operated. This type of crystal filter had been introduced in late-1940 with National's NC-200 receiver. After that change, National referred to the new HRO Senior as the HRO-M or MX. During WWII, the HRO-M was improved with ID rings added to the AVC and B+ toggle switches. Many HRO-M receivers will have a 0-1mA scaled S-meter made by Marion Electric. Initially, these mA meters were only for the receivers being sent to England but later many military HROs had this meter installed. The S-meter "pull-switch" was replaced with a black-finish, ball-handle toggle switch. 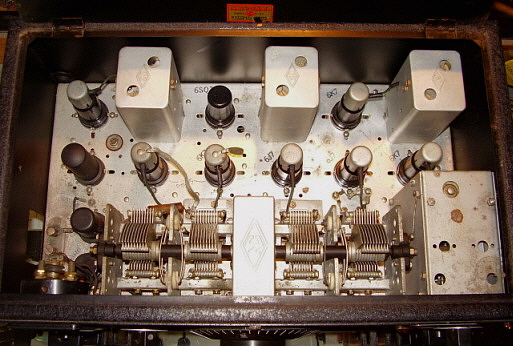 The HRO-M used the same glass tubes as it predecessor, the HRO Sr.
photo above: The U.S. Navy RBJ-2 receiver featured 50kc to 400kc and 480kc to 30mc coverage with nine coil sets. The RAS, RBJ & RAW, etc. - The U.S. Navy wanted a simple to use receiver and National supplied HRO Juniors in fairly large numbers as the RBJ, RAW and the RAS (possibly other designations were also used.) The RAS was a special receiver that had a 175KC IF to allow tuning through 400KC to 500KC range without interruption. The lower end of the frequency coverage was 190kc. The RAS models also have special coil sets for 175KC IF operation and are identified with a special number code. The RBJ individual coils (four in each coil set) are also apparently different than the standard HRO because National assigned them a different number code. The Navy receivers were normally rack mounted and usually were supplied with anywhere from five to nine coil sets that were housed in a coil storage box that was rack mounted. The RAS came with seven coil sets while the RBJ was supplied with nine. Unlike the HRO which used letters to ID the coil sets, the RAS and RBJ used a number ID, 1 to 7 for the RAS and 1 to 9 for the RBJ. The power supply was a rack mounted type and the power cable from the receiver was a shielded cable (even though cloth covered.) 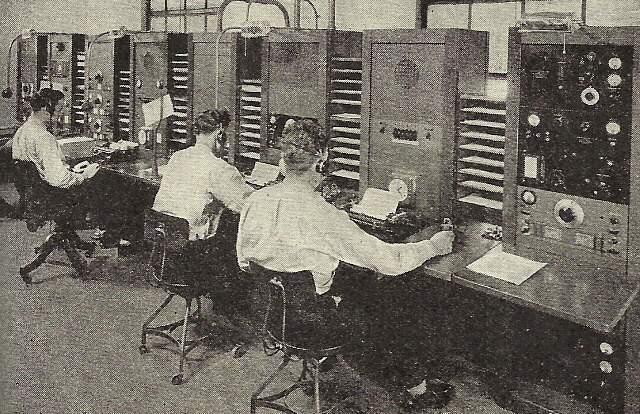 Loud speaker panels were generally not included in the rack since nearly all Navy operations required headset reception by the radioman. During the RBJ, RAW and RAS production the plug-in coil set panels were changed from 3/16" thick aluminum to 1/8" steel panels. Small ID tags are mounted between the frequency graph and the logging chart for coil identification.In fact, all of the Navy HRO receivers have a multitude of data plates on the coil box, the power supply, the receiver and each coil set. Unfortunately, over the years many of these Navy HROs have been stripped of their data plates making actual identification somewhat difficult without a close inspection. photo above: The U.S. Coast Guard version of the HRO Senior was designated as the RC-105 and the matching loudspeaker was designated as the R-115. The set shown belongs to Brian KN4R who supplied the photograph. Other Designations - The U.S. Coast Guard also purchased HRO receivers with designations of RC-105. These are HRO Seniors and probably date to shortly before WWII and into the beginning of WWII. Additionally, the British designated some of their HRO-M receivers as R-106. To further add to the confusion, the U.S. Army Signal Corps also identified some of their HRO-M receivers as R-106. The Signal Corps versions have a specific data plate mounted in the upper right corner of the panel. There was an HRO-12-S that operated on a 12vdc battery system with the 1286 power pack which may have been built for Canadian use. The U.S. Navy also had the RDG which was a scanning receiver that interfaced with a panadapter. The RDG used plug-in coil sets that are identical to the HRO (even using the same individual coil identification numbers.) There are certainly many more designations and variations. 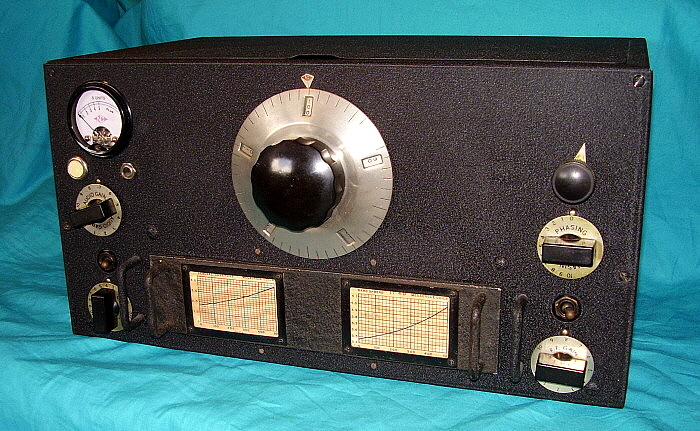 During WWII, the many variations of the HRO and its accessories were necessary for the various uses the receiver was put to and for the various end-users of the receiver. Some end-users modified their HRO receivers to their specific needs and these receivers were sometimes given new designations. 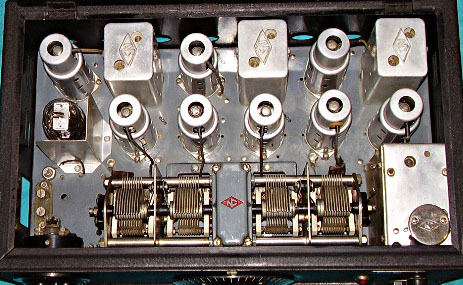 The HRO-5 & HRO-W - Near the end of WWII, the HRO was upgraded to all octal metal tubes (except the 6V6GT "glass" audio tube) and most of the components became JAN standard values. This receiver was dubbed the HRO-5. The HRO-5 was identified as HRO-W if it was going specifically to the Signal Corps. They are virtually the same receivers. The HRO-W will have a military data plate installed in the upper right corner of the panel that specifically identifies the receiver as "HRO-W" and the contract number is "49906-PHILA-45-03." The HRO-5/W receivers generally have a Marion Electric S-meter that is non-illuminated and has a white metal 0 to 1.0mA scale. The National manual is not very specific about the S-meter and some HRO-5/W receivers have turned up with the standard amber S-meter scale installed. The common belief was that the all white scale mA meters were exported to England but there were many exceptions to this and the HRO-W is commonly found with the mA meter. Additionally, the S-meter ball-handle toggle switch was replaced with a "bat handle" toggle switch. The HRO-5/W cabinet was changed to have no ventilation holes in the rear panel of the cabinet or louvers on the sides. 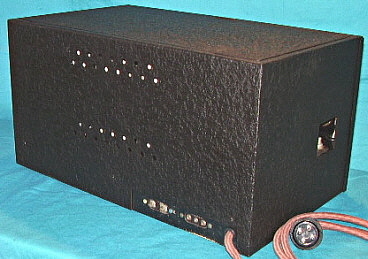 The HRO-5/W was sometimes powered by the 697W heavy duty power supply. Sometimes receivers were given a heavy moisture and fungus proofing for severe service depending on the intended location. Audio output transformers are shown as optional for the HRO-5 in the National manual but are shown on the HRO-5 schematic. The HRO-W didn't have an audio output transformer installed in the receiver. With the HRO-5/W, coil sets were changed to have a large aluminum plate with silk-screened frequency graph and logging chart along with the coil set identification mounted onto the front panel of the coil set. 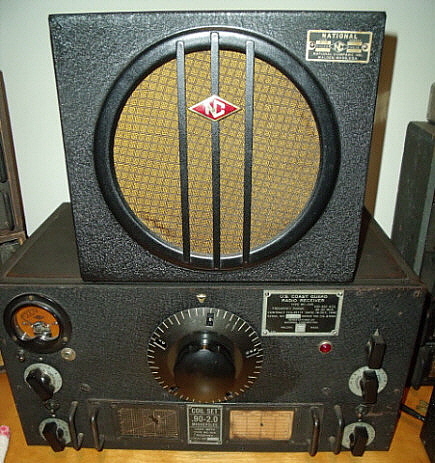 All HRO-W receivers reported so far are from the WWII "K" production run in 1945. All HRO-5 receivers appear to be from the WWII "J" production run in 1945.
photos left& below: The Signal Corps version, the HRO-W sn: K-127, from mid-1945. All HRO-W receivers were heavily coated with MFP which is a yellow lacquer with a fungicide added. Even the knobs are MFD'd. Note the gold appearance of the knob skirts and the olive drab appearance of the PW-D dial which is due to the heavy MFP coating. Under the lid is silk-screened data with a place for stamping an application date. In this receiver's case, the date is JUL 29, 1945. 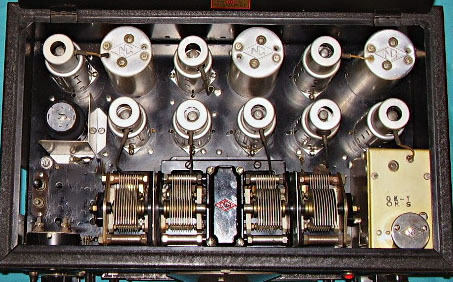 Also note the use of metal octal tubes that began with the HRO-5/W receivers, the non-ventilated cabinet and the silk-screened coil ID plate. HRO Copies from Other Countries - National Co., Inc. published a pamphlet in 1964 that celebrated their 50th anniversary in business. Inside that pamphlet, National mentioned that both Germany and Japan had produced "knock-offs" of the HRO. Shown in one of the photos in the pamphlet was a technician testing one of the German HRO copies. Also shown was one of the Japanese copies. Both photos are shown below. The Germans built at least two HRO copies during WWII, the Korting KST and the Siemens R4. After WWII, a few other copies were built in Eastern Germany. Later versions of the East German copy used Czech tubes and Russian resistors. photo left: A National engineer testing one of the WWII German copies of the HRO. Note the HRO-5 receiver to the left of the German HRO. Also, note the incredibly huge General Radio 805-C Signal Generator being adjusted. photo right: A Japanese copy of the HRO from WWII. Note that the nomenclature is entirely in Japanese. These copies were not as "literal" as the German copies. Both photos are from "National's Anniversary Photo Album" - published in 1964 for National's fifty years 1914-1964 in business. Kingsley Radio Company - AR7 - In addition to Axis-created copies of the HRO, some of our allies also created "knock-offs." Probably the best known HRO "knock-off" is the AR7 receiver built during WWII by Kingsley Radio Co. of Melbourne, Australia. The Australian Army referred to the AR7 as "Reception Set No.1" while Kingsley's original designation was K/CR/11. Though the AR7 has a micrometer dial and uses plug-in coil sets, that's about as far as the HRO copying went. The AR7 uses eight tubes (plus two in the original PS) and covers 138kc up to 25mc using five coil sets. Rather than using a separate Mixer and Local Oscillator, the AR7 uses a Converter Stage. The tubes employed are standard "American" tube types. 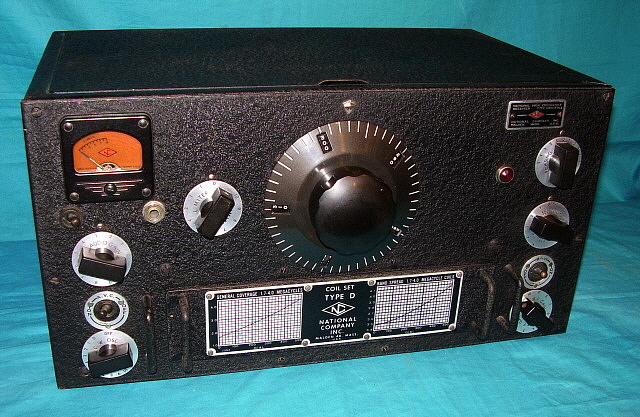 The receiver uses a stainless steel overlay on the front panel although some of the Australia Army receivers have the front panels painted green. Interestingly, the S-meter on the AR7 works "backwards." Full scale is "0" and mechanical zero is "9." Additionally, the micrometer dial also works "backwards" (when compared to the HRO) with 0 being the highest frequency tuned and 500 being the lowest. All AR7 receivers were rack mounted with a rack mounted power supply and a rack mounted speaker. The audio output impedance was approximately 1750 Z ohms and 600 Z ohms and the panel jacks provided both audio outputs. Probably around 3000 AR7s were produced. 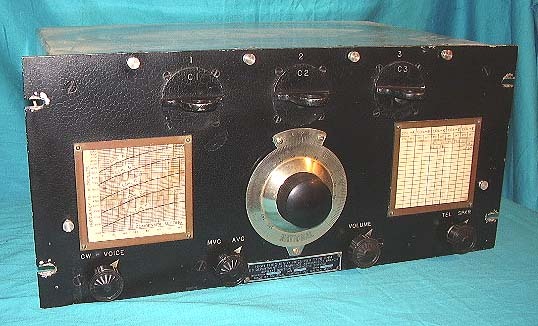 After WWII, the AR7 was used extensively in airports around Australia as a communications receiver. Some of the receivers had the LO coil removed from the coil sets and a Crystal controlled oscillator installed for "fixed frequency" operation. It was common to find "banks" of modified AR7s in Australian airports post-WWII. See "Collector's Gallery" below for the Amalgamated Wireless Australasia AMR-100 "HRO Copy" from K6DGH. 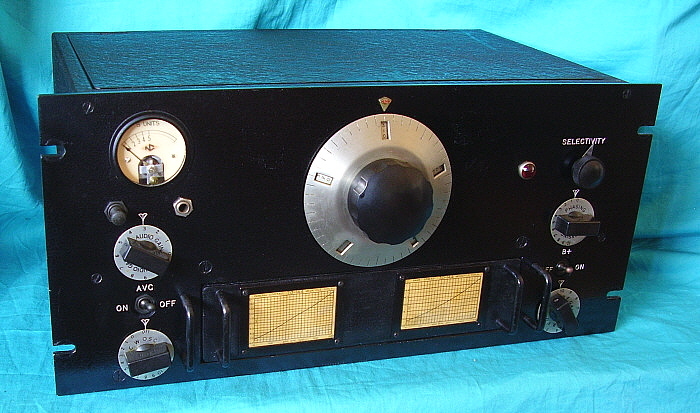 photo right: Kingsley Radio Co., Melbourne, Australia - AR-7 receiver. Most receivers left the stainless steel front panel overlay unpainted with the nomenclature slightly polished to improve its readability. Note that the coil graphs are also stamped stainless overlays. Two graphs are used to improve the accuracy of the graph. The coil sets are general coverage only. At the end of WWII, almost all manufacturing had been for the war effort since 1942. Most companies were ready to start civilian production by September 1945. National, like most other radio companies, offered what had been late WWII receivers as the initial, post-war product line. 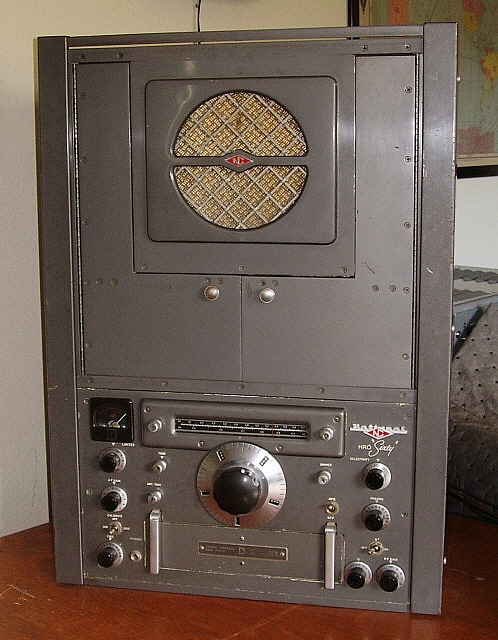 The first post-WWII receivers offered were standard WWII HRO-5/W models with general coverage coils and a aluminum silk-screened panel with graphs and ID mounted to the coil assembly. These coils sets will be ID'd as JA, JB, etc., to indicate they are general coverage only. Since the military HRO-5/W came with nine coil sets, this may have been offered with the civilian HRO-5/W (at an extra cost.) It's also likely that some of the civilian HRO-5/W power supplies were the heavy duty 697W. 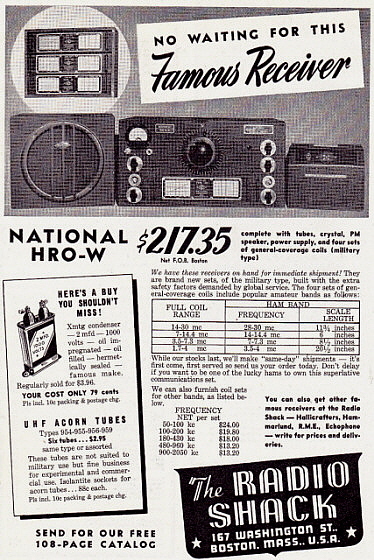 See 1946 Radio Shack Boston ad below showing the HRO-W being offered for $217.35 including power supply and four coil sets. Note that the other five coils sets are offered at an extra cost. No wonder it's so hard to find an HRO-W with its complete original nine coil sets. Additionally, the power supply shown in the ad's artwork is the standard 697 and not the heavy-duty "W" version. As expected, the coils sets are "J" version non-bandspreading types. Note that the meter shown is the 0-1mA Marion Electric that was standard for the HRO-W.
photo above: The HRO-5TA1 sn: 184 1054. 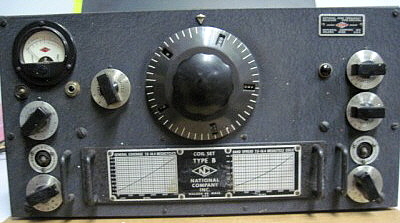 This is a very late version of the receiver (made well after June 1946) featuring the square S-meter made by Marion Electric which was used to conform with the S-meter used on the NC-240D receiver. Also, this receiver has the later cadmium-plated chassis and the six-step Selectivity control for the Crystal Filter operation. Note the increased spacing between the two Crystal Filter controls. The HRO-5A1 was introduced around March 1946 although this receiver is still basically built from mostly "left-over" stock. 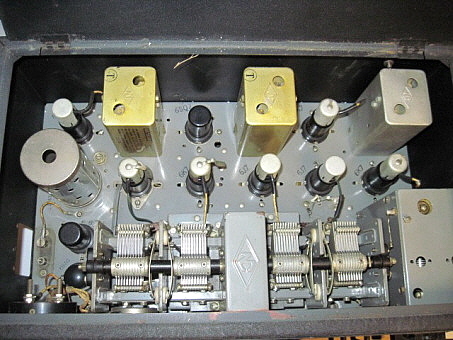 The 5A1 featured a Noise Limiter circuit that added two more tubes to the receiver bringing the total to twelve tubes. There was no ideal place to add the Noise Limiter control so National mounted it about the only place there was room for it - to the left of the PW-D dial. The Noise Limiter potentiometer somewhat blocks easy accessibility to the 1RF adjustments when performing an alignment. The NL circuit is built onto a small chassis on these early receivers. The hum resistor on the tube heaters was eliminated and instead one side of the heater line was connected to the chassis. Typically, the National ID plate is mounted over the NL control. Many of these early versions are MFP coated for some reason. On all HRO receivers built between September 1945 up to about June of 1946, it's apparent that National was trying to clear out any of the old stock along with the WWII stock and just about anything they thought they could put into a receiver and successfully sell it. National had two warehouses in the Malden area with lots of "left-over stock" to work through. Consequently, any HRO-5, HRO-5A or HRO-5A1 made in that time period is likely to have parts that seem to come from either different receivers or a different time period. It's difficult to list all of the variations that could be possible. Just suffice it to say that just about any combination of parts are likely to be found on the HRO receivers built between September 1945 and June 1946. These early HRO-5A1 receivers were offered up to July1946. The photos to the right show an HRO-5TA1 probably built around April or May of 1946. 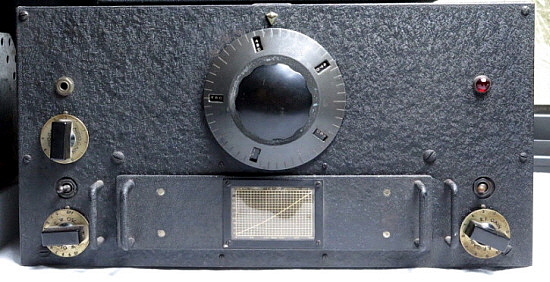 Although this receiver appears to have the National tag installed back in its proper place in the upper right corner of the front panel, note that the S-meter scale is an earlier style scale from pre-WWII but it is installed in the typical WWII Marion bakelite meter case. Note on this version that the Crystal Filter is still the older style with the close spacing of the two small dials and with the Selectivity control as the upper dial. >>> Though difficult to tell, the Noise Limiter is still being built onto a small chassis mounted on top of the main chassis. Note the cable routed across the chassis going to the NL chassis. The cable exits the chassis to the right of the 6V6 audio output tube. A new version of the HRO-5TA1 was introduced around July, 1946. It featured a new Noise Limiter circuit that was now built onto the receiver chassis which was now cadmium-plated. At the same time, the Crystal Filter was changed to a more conventional circuit that National had used on the WWII NC-100XA series (RAO USN receivers) with a six position switch controlling Selectivity and a variable capacitor to adjust Phasing. The position of the two controls were interchanged and the spacing between the two controls increased when compared to the earlier HRO Crystal Filter. Another change was to the S-meter which became a Marion Electric meter with a square housing (to conform with the meter used on the new NC-240D.) Additionally, on the later HRO-5A1 receivers the serial number format is changed from the old letter designation for production run identification to a three digit number identification. The specific receiver is identified with a four digit number which results in a seven digit serial number that was then relocated to the rightside of the chassis about midway back. 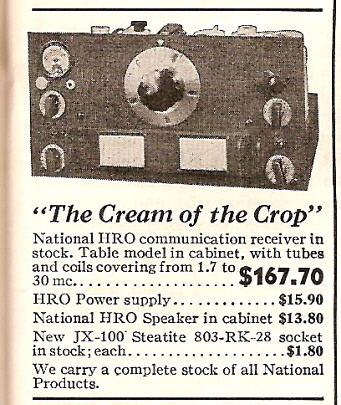 Although dealers began offering the newer version HRO-5A1 as early as July 1946, National didn't feature it on a back cover ad in QST until February 1947. The construction of these later HRO-5A1 receivers is very consistent and will use all new parts in the assembly. photo right: Inside a very late version HRO-5TA1 (sn: 184-1054) showing that the chassis is now cadmium plated (post-July '46 units,) two more tubes are added next to the left side of the tuning condenser for the chassis mounted Noise Limiter. Also, note the NATIONAL decal has returned and is installed under the lid. These decals began to be installed on cabinets very early in production - by run-G (1935) but were not applied to the cabinets during WWII. Also, note rear wall of cabinet has no ventilation holes as the pre-WWII HRO Senior cabinets did. HRO-6 - Are the Late HRO-5TA1 Receivers Actually HRO-6s? 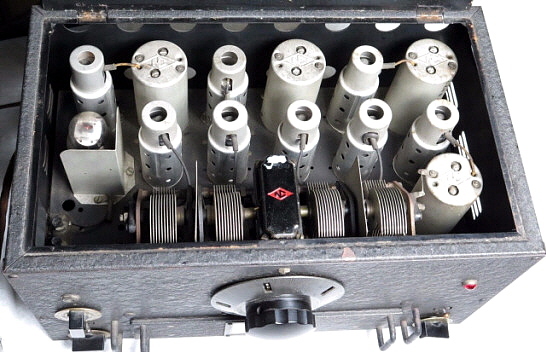 - In late-1946 or early 1947, a short lived HRO-6 was produced with an "improved" Noise Limiter but its physical appearance is identical to the HRO-5A1. Some National manuals will have an advertisement in the back pages for the HRO-6. These ads date from 1946. Very few HRO-6 models were sold and it is seldom encountered today. It's known that HRO-6 receivers were built with-in the same production run as some late versions of the HRO-5TA1 receivers. 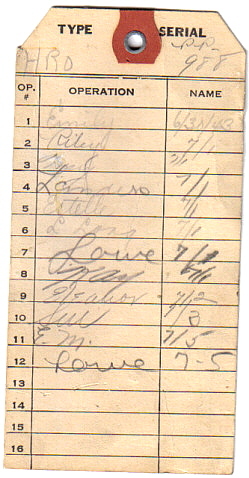 Note in the "HRO Serial Number Log" (below) that the two HRO-6 and nine of the HRO-5TA-1 receivers are all from run 184. Interestingly, five of the HRO-5TA-1 receivers (one of which is the "very late" HRO-5TA1 shown in the photos above) are apparently higher serial numbers than the highest reported HRO-6 serial number. Also, one HRO-5TA1 serial number is within the HRO-6 serial number range of reported numbers. It appears that for a very short period of time, during the middle of run 184, the HRO-6 designation was used on only a small quantity of receivers. The HRO-6 serial numbers seem to be inter-mixed with HRO-5A-1 serial numbers. It might be possible that National considered identifying the later, post-July 1946 HRO-5A1 receivers as the "HRO-6" since these late HRO-5A1 receivers incorporated so many changes when compared to the HRO-5, HRO-5A and the highly variable (construction-wise) early versions of the HRO-5A1 receivers. In comparing photographs of the HRO-6 to the late version HRO-5A1, there are no apparent differences and perhaps only the ID tag is the sole change. Perhaps the "improved" NL was the fact that these "late" HRO-5A1 receivers had the NL built onto the chassis rather than the separate small NL chassis used in early HRO-5A1 production. National may have "jumped the gun" on the HRO-6 designation since basically the post-July 1946 HRO-5TA1 (or HRO-6) looked very much like all of the proceeding HRO models. However, why are some receivers identified as HRO-6 and others, within the same range of numbers, identified as HRO-5TA1? Maybe only one small production line produced some HRO-6 receivers while most of the assemblers produced HRO-5TA1 receivers. The intermixing of model designations is odd (but National did do a lot of odd things.) National had certainly started design work on the HRO-7 which was going to have significant changes to its external appearance, fitting a new model receiver designed after WWII. Maybe to keep the "older" looking HRO-6 from being mistaken for National's "new post-WWII design," the designation of HRO-6 was quickly dropped while production of the HRO-5TA1 continued. National didn't want the late-1946 (1947 model year) prospective customers to think that National was still just "revamping" the old HRO as their new model receiver. By stopping the HRO-6 designation, the introduction of the HRO-7 would then have been seen as National's "new post-WWII design" and that their "new" receiver would have a "new" look, completely different from the older HRO receivers. For the 1947 model year a complete "make-over" was given to the old HRO. Introduced in mid-1947, the HRO-7 had a new cabinet with slightly rounded corners, a smooth light-gray paint job, levers for easy coil removal, S-meter viewed though a panel "cut-out," different knobs with light gray grips, a light gray PW-D....however, the HRO-7 circuit remained basically the same as the early HRO-5TA1. There were some tube changes and a tube addition with the local oscillator changed to a miniature tube (6C4) and an added voltage regulator (0A2) but the HRO-7 was really not much more than a cosmetic upgrade. It's introduction did spell the end of the rectangular, black wrinkle finish box though. The HRO's exterior had remained basically unchanged for the past 12 years. 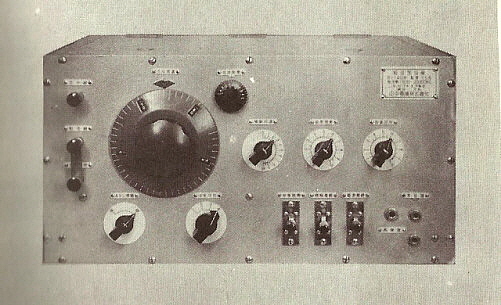 The HRO-7 was also offered in a rack mount configuration called the HRO-7R and it was very different from the table model with black wrinkle finish panel, external S-meter mounting, a black PW-D and different knobs. Generally, the rack included a coil storage unit and a rack mounted speaker. The HRO-7 was available for about three years but National's next upgrade was going to change almost everything about the old HRO receiver. 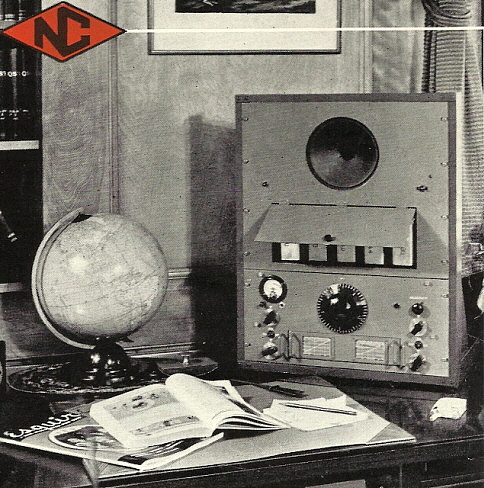 photo above: 1948 advertising artwork for the National HRO-7, note that the speaker style was also changed to a more "modern" look. The HRO-50 and HRO 50-1 - The new HRO-50 was going to bring the HRO design into the mid-twentieth century. The separate power supply was first on the list of things that needed to go. 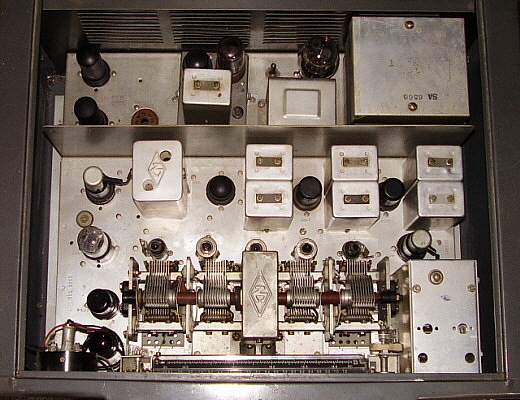 The new HRO power supply was built-in though on a separate chassis that was bolted behind the main receiver chassis and thermally insulated from the receiver chassis by an asbestos sheet that was also continued up to the top of the vertical divider panel to provide insulation from the heat from the rectifier tube and the audio tubes. Relying on the micrometer dial versus graphs was also gone. Now an illuminated linear slide-rule dial would provide direct frequency readout. Changeable plastic scales were mounted to a front panel controlled, rotating drum, providing band-in-use scaling. The PW-D dial was now just for logging purposes. An Antenna Trim control on the front panel was finally incorporated. Auxiliary sockets were provided for the optional 1MC/100KC crystal calibrator and NBFM adaptor. Also, a Local Oscillator Trim that allowed front panel calibration for the best dial accuracy (using the crystal calibrator - either the optional one or an external calibrator.) Voltage regulator, push-pull audio, 8Z ohm and 500Z ohm audio outputs - almost everything necessary to update the old HRO. The plug-in coils had to remain along with the PW-D micrometer dial otherwise it wouldn't even have been an HRO. 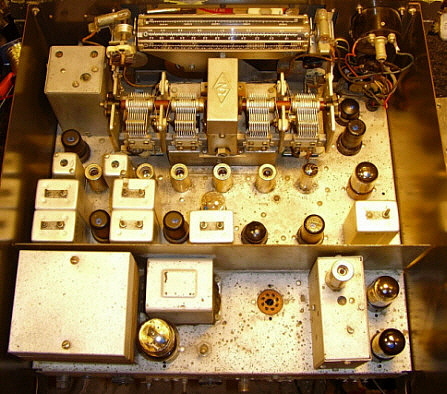 The HRO-50 was introduced in 1950 and was followed quickly by the HRO-50-1 that added an extra IF amplifier and, to improve selectivity, double IF transformers were used in last two IF stages (three dual transformers that included a dual IF output transformer to the detector tube.) With 12 tuned IF transformers, the receiver was very selective. The HRO-50-1 was produced in 1951 through 1952. Early versions of the HRO-50 had grey grip knobs with bright aluminum skirts. 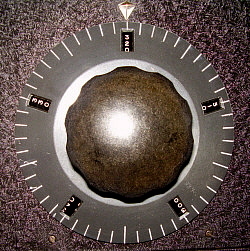 Even the PW-D used the gray HRT-style knob on the earliest versions. Later versions will have gray knobs and the PW-D will have the standard HRK-style black knob. 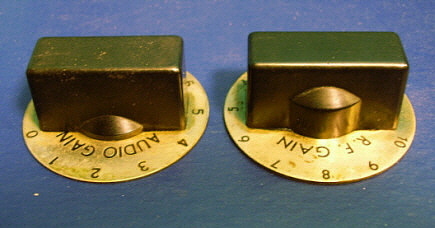 All HRO-50-1 versions have all black knobs. If the receiver is a table cabinet it will be labeled as "HRO-50T" or "HRO-50T-1." Rack mounts substituted an "R" for the "T" and are so-marked. The USCG contracted with National to supply HRO-50 receivers as the R-460/UR. The contract was issued in 1949. R-460 receivers are black wrinkle finish and have a data plate mounted in the upper right corner of the front panel. Coil panels are not painted but have a chemical treatment something like irridite leaving the metal with a light gold coloring. Photo below left shows the chassis of the HRO-50T. Note the standard IF transformers used in the two IF amplifier stages. 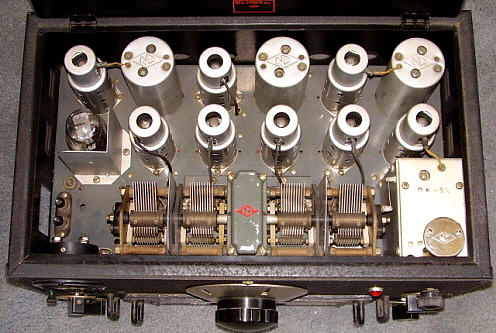 Also note that the two IF amplifier tubes are 6K7 tubes with grid caps. 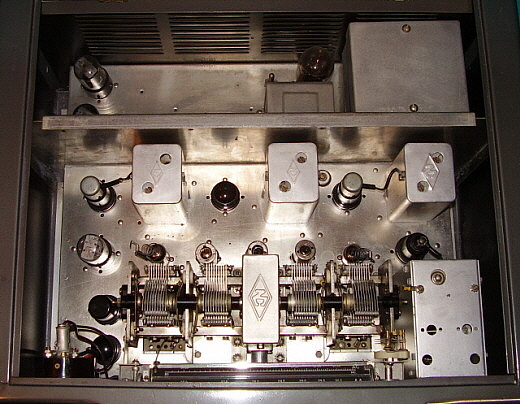 In the photo below right is the HRO-50T-1 showing the three IF amplifiers with the dual IF transformers that includes the input transformer to the detector stage. Also note, the 6SG7 tubes (no grid cap) for the second and third IF amplifiers. This receiver is also equipped with the optional NBFM adapter. The HRO-60 - The final evolution of tube-type HRO receivers was introduced in 1953 - the HRO-60. With 18 tubes, double conversion and a current regulator on the oscillators, it was the final evolution of the tube-type HRO. Double conversion was utilized above 7MC when using coil sets B and A or any of the A prefix bandspread coils available. Bandspreaded 40M required the C coil set which wasn't double conversion. The HRO-60 accessories included coil sets J, H, G, E and F, providing general coverage from 50kc to 430kc and 480kc up to 2.0mc. Additionally, an AC coil set provided bandspreaded 15 meter coverage. AD covered 6 meters. There were two other "A prefix" coil sets, the AA and the AB, both of which bandspreaded in the 27mc up to 35mc ranges. The HRO-60 was available from 1953 up to about 1964. At the end of production, the selling price had escalated to an unimaginable $745.00! As with all of the HRO receivers, rack mount versions were available that featured a 30" tall table rack that allowed mounting of a coil storage unit and a rack mounted speaker. These rack mounted speakers with coil storage were available as early as with the HRO Senior receivers and, with the introduction of the HRO-50, the type SC-2 coil storage and speaker combination became available. Special "dust covers" were installed on these later rack-mount receivers that fit over the side panels and are held in place with two knurled thumb-screws. The HRO-60R is only labeled as HRO "Sixty" with no specification as to its rack mount construction (the same is true for the table cabinet.) When using one of the rack mounted speaker set-ups one will notice somewhat of a reduction in the bass response due to the lack of any true enclosure for the speaker. This is typical of most rack mounted speaker set-ups. >>> With the direct readout dial on the HRO-60 it is possible to achieve very accurate tracking. You'll find that it is tedious work since each LO low-end adjustment will require coil set removal, then making a slight adjustment followed by reinserting the coil set to adjust the high-end trimmer and then checking the tracking. With patience it's possible to have the HRO-60 (or HRO-50) dial achieve a very accurate readout considering that its resolution is somewhat limited. Performance - The HRO-60 is often times berated as less of a receiver than its predecessor, the HRO-50 but this is mainly from hams who are looking for maximum bandwidth for AM signals. 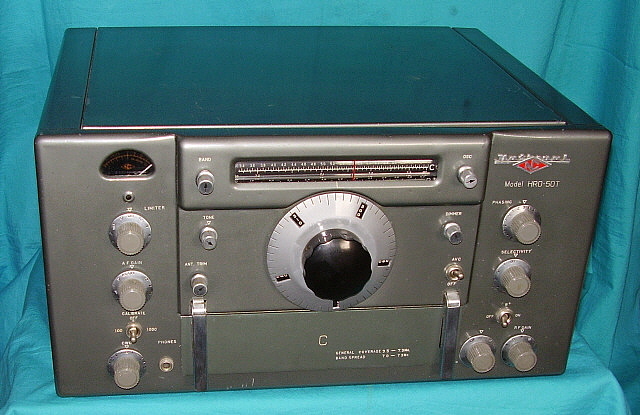 The early HRO-50 used two rather conventional IF amplifiers that provide a typical "bell curve" passband which many AM ops find pleasing to listen to. However, the HRO-60 and the HRO-50-1 were trying to cope with the crowded band conditions of the fifties and sixties where successful communication was the goal. The additional IF transformers and IF amplifier stage provided a narrow passband with steep skirts resulting in very selective tuning. An excellent Crystal Filter circuit also helped with difficult QRM. Operating a rebuilt and correctly aligned HRO-50-1 or HRO-60 is a pleasure - QRM is rarely (if ever) a problem and the receiver is still a competitive performer at any frequency. However, that isn't to say that the early HRO-50 isn't a capable performer that is able to handle QRM with its Crystal Filter and provide excellent audio when conditions allow for it. photo left: The HRO-60R chassis. The smaller IF transformers are for the first conversion set-up. Note the two dual IF transformers - the HRO-50-1 used three dual IF transformers. The rear of the chassis has the Calibration Oscillator installed but a NBFM module is not installed.